Discussion in 'Roadster' started by tonybelding, Jan 3, 2016. Wasn't sure which forum was right for this, but anyhow. . .
My Roadster is in for annual service, and it may take a while with several minor issues being addressed. Thus, I have a Model S on loan for the weekend, and perhaps a day or two longer. Despite my many years of Tesla fanboy-ism, I'd never actually driven a Model S before. This has been a fun weekend, and educational for me. The car I got is a red P85. It's beautiful inside and out. (People griping about the interior boggle me.) It's smooth. It's quiet. It's comfortable. It's convenient. It has enormous cargo space, front and rear. The huge touch screen is brilliant. It seemed alien and intimidating at first, but after about five minutes of poking around I'd mastered it -- without any instructions. By comparison, my Jeep Grand Cherokee still sometimes befuddles me after owning it for a year. This is a large car. It's not as big as grandpa's old 1972 Lincoln Continental (aptly named! ), but by today's standards it's very much a full-sized car. Squeezing it into the garage space normally inhabited by my Roadster proved not to be a viable option. I ended up stringing the charge cable under the garage door and simply backing the S up to it. The ride height, smoothness and quietness of this car deny any sense of speed. If I don't keep an eye on the speed-o-meter, I can be doing 100 MPH in a few seconds and not even realize it. This is very contrary to the Roadster experience. And although the S is responsive enough, it never feels as nimble as the Roadster. Because it's not. It's a muscle car, not a sports car. And what muscle! This car has a serious traction problem. The motor just keeps writing checks that the rear tires can't cash! I find it common -- and a bit disconcerting -- to pull onto the highway, or pull away from a light, and feel the car lurch as the traction control catches it. Switching off the traction control results in a wild ride. With the Roadster I find that losing traction just doesn't happen by accident, at least not on good, clean pavement. It stays glued. Which car is "better"? I could come up with a long list of ways that the Model S is a better car than the Roadster. It really is as amazing as so many people have told me. But. . . They are very different categories of vehicles, suited for different purposes, and the Model S is not a better Roadster than the Roadster. So. . . I'm quite enjoying my few days with this beauty, but I'll be pleased to get my own precious little Roadster back. ... Squeezing it into the garage space normally inhabited by my Roadster proved not to be a viable option. I ended up stringing the charge cable under the garage door and simply backing the S up to it. I get to drive the Roadster when my wife "let's me" and they are two different drives. I've had a P85, P85+, P85D, and 70D loaners. As well as S85. Needless to say, it's no comparison. Roadster is a fun drive and Model S is a lot more "refined". So many bits of this have been my experience also with Model S. My experiences have started the same - getting a loaner when the Roadster is in for service or annual maintenance. My garage has the same problem (too small - clearly, I need a new house), with the same solution - string the charging cable out under the garage door. The lack of any sense of speed has gotten me also. I remember turning onto a big open clear stretch of 4 lane highway in town with nobody in sight. Model S was doing 70 and I was still waiting for it to take off Must be very careful with that right hand pedal. Well, my car is in for a new front bumper, and they gave me a... Seat Ibiza diesel with zero extras. This must be the most base car of the whole Volkswagen group. At least it makes it easier to choose which car I prefer, and puts be back on my feet to realize what a great car I get to drive every day. I've always told folks that the Model S is a better vehicle in every way, shape, or form...but the Roadster is more fun to drive! Roadster is more fun and more maneuverable, and it's a convertible. Model S is more comfortable, and faster. Roadster wins at autocross. Model S wins at highway driving. I actually had the opposite experience - I took my Model S in to get summer tires last spring and I got to borrow Tesla Canada's Very Orange Roadster. That was a fun day and a half! But the in-car technology was like going back in time a bit. I went through a similar thought process (Long Term Roadster Ownership Jitters). After I posted this, I had another 5 weeks in the P85+, and it was great, but I was really missing the Roadster by the end. The Model S is a great car, but after driving it a month, I realized (remembered?) that I don't like big cars. I also completely forgot how loud the Roadster is. That I didn't miss. Worth noting - one of the loaner cars I got was a P85+, sometime after I'd had the P85. That one loaner car was "expensive" for me, in that by the time I gave back the +, I knew that in any S or X I acquired in the future, whatever that future version of an upgraded suspension was, I would have to pay for it (this was at a time where there was a more expensive suspension to be paid for). The P85 had a floaty feel to it under sharper acceleration and cornering that I really didn't care for, and the P85+ took that out. As best I can tell, today there's no suspension choice / upgrade to make. Either all cars have the same improved suspension, or the P flavors have the improved suspension bundled with the Performance package. I too have had a Model S twice now for loaners. It is MUCH more refined than the Roadster. But while it is a great car if someone were to offer me a straight trade of a nice Model S for my Roadster I really doubt I would take it. As many have said they are VERY different cars. On a spring/summer/fall day with the top off I can't imagine anything more fun that the Roadster. Put another 10 years on my knees and I may consider that trade but for now I am happy. The thing is, the MS won't fit in my garage either, and in time, with Garage Contents Entropy what it is, that space issue isn't going to get any better. I suppose I could trade out the wife's SUV, but last I checked, the MX was even bigger than the MS, and both are bigger than her Honda. If my 83 year old mother-in-law can get in and out of the Roadster (once), I have motivation enough. I have created a similar thread in the past. All in all I do not like the Model S.
Stupid touchscreen when buttons would be superior, poorly located front door pillar that unnecessarily makes the car awkward to enter and exit, and limited battery life [especially in the Winter], and a poor computer algorithm that miscalculates Winter mileage remaining on the battery significantly. I find regeneration and mileage consistency [not distance] to be superior in the Roadster. These things led me to lease a BMW X6 with M package instead of leasing the Model S.
LOL...Tobash, you must remember there is a learning curve to learn how to enter / exit the Model S...and imo, it is way less steep than we had for our Roadsters. You described the difficulties of entering the Model S...most folks would say that the Roadster is far more difficult to enter / exit than the Model S is...you, me, and most Roadster owners find it easy because over time, we are familiar & comfortable with the procedure. I like the Model S's large touch screen...it makes every function it handles easier than the puny double din screen in my Roadster...I don't feel the winter driving range of the Roadster's battery to be any better or worse than the Model S. I wish the Model S had heavier regen like my Roadster, but that is a personal preference that most Model S owners don't seem to agree with. As I've said before, I feel the Model S is a much better vehicle, but less fun to drive than the Roadster (the Model S is still a great vehicle to drive though)... 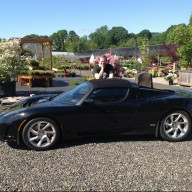 I've driven a Roadster for 5 years now...I'm lucky if my wife lets me drive the Model S once a week. :wink: ...I am far less experience with driving the Model S, so I think it is completely natural that I am more comfortable driving the Roadster. I am disappointed that you dislike the Model S so much, that you leased an ICE vehicle...that is a step backwards for the cause, and, in my experience, ICE vehicles just don't match up with the fun of driving an EV. My repairs took longer than expected, and I didn't get the Roadster back until today. In all I had the P85 for a week and a half. I even took a trip to the nearest Supercharger -- and had coffee and a muffin at Collin Street Bakery. Nice place! Before the end of this episode I did find myself missing the Roadster. When I want to go take a spin for fun, the Model S just wasn't the same. It also doesn't attract as much attention. The Model S's switchgear (which I'm aware was not produced by Tesla) is cumbersome. The PRND stalk is counter-intuitive and easily fumbled in comparison with the Roadster's push buttons. The cruise control stalk is completely hidden, and I often found myself fumbling with the turn signal or wipers when I meant to operate cruise control. When I started to come home today in the Roadster, I took off the parking break, hit the D button, and. . . nothing! What? Oh yeah, I have to insert this "key" thing. When I got home and plugged it in to charge, it started beeping urgently at me. I looked inside at the message. . . Do not open the charge port when driving! Huh? Oh yeah, I have to take this "key" thing out of the car. Finally a thread that flawlessly discusses what I've been thinking in my head for so long. Last year, when I took 1213 in for service, they loaned me a 2014 Multi-Coat Red P85. It had every option except rear facing seats and the Ultra Hi-Fi Sound. They ended up letting me take in the Roadster three days ahead of schedule for the annual maintenance, so that I could spend some time with it. First thing I noticed as well, was the traction issues. My theory, is that the Michelin Pilot Sports that were on the loaner, weren't very ample for acceleration of such a quick yet hefty vehicle. Now, side-step to present day, where I've sold 1213 and somehow ended up with a 2012 Signature Red P85, the Continental Extreme DWS tires I have seem to keep it stuck to the road 90% of the time in acceleration, AND it's winter time. I'm much more pleased with it now than I was with the loaner. I love the P85, and I think the technology in the Model S is LEAPS ahead of the Roadster in terms of convenience. For example, being able to keep the climate control, sound system, lights, internet, etc. on while charging, is the greatest thing ever. I took a 40-hour trip to Colorado in my Roadster last year, and at some points had to sit in the car with nothing whatsoever to look at except the VDS displaying the miles. Also, having a backseat to lay down in while charging is really neat, if you're like me and love to take road trips. The Roadster, with its fixed seats, was not that graceful. Can't deny the ease of supercharging as well. 200+ miles of range in about 45 minutes is dreamy. STILL: the Roadster is and always will be my favorite car of all time, and I miss it every single day. I went from driving about 70 miles a night just for leisure with the top down. Now, I find myself hardly taking that sort of cruise. It's just not the same. I expect I'll be back in a Roadster eventually. Well their change in SE vice policy hit me me full force. Not only do I not get a loaner rather I have to arrange a $725 tow to the shop. I assume when it is done I pay another $725 to get it back. With the car not starting or charging I see to have very few options. I am afraid the battery is out and I hear the new ones are many months out . Sorry for your bad luck. Maybe it's time to rent a trailer?